Four typically nondescript crosswalks in downtown State College have been transformed into colorful symbols meant to show State College as a welcoming community. The crosswalks at the intersection of South Allen Street and Calder Way have been painted a rainbow of colors in recognition of LGBTQ Pride Month, which is celebrated nationally in June and was proclaimed in the borough by Mayor Don Hahn at the June 4 borough council meeting. 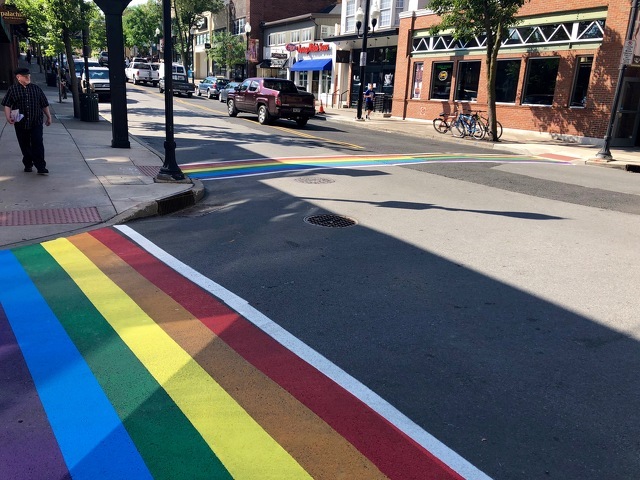 Councilman Dan Murphy brought forward the idea for the rainbow crosswalks -- which have been installed in several major cities around the country -- at last week's borough council meeting. Council unanimously supported the project and borough public works staff got to work within days to make it happen. Crews started the work over the weekend and were finishing it up on Monday. The effort is a collaboration between the State College Borough’s Office of Community Engagement and Penn State University Park Undergraduate Association, which supported the idea and is helping to fund the cost. "I’m thrilled to see this idea become a reality so quickly," Murphy said. "Pride month is a celebration of the contributions, history, lived experiences, and identities of the LGBTQ+ community. It is a powerful statement for State College to join that celebration with the rainbow crosswalks downtown. I appreciate UPUA’s ongoing commitment to supporting projects that affirm and celebrate all that call State College home." Tom Dougherty, UPUA representative to borough council, thanked Murphy for shepherding the project and said he hopes it will lead to other efforts in the community. "It is our hope this marker will lead to a more welcoming community and possibly a future State College Pride march," Dougherty said. "I was made aware a lot of individuals have to go to major cities to be able to go to these marches… so it’s already on our outreach agenda for this upcoming assembly to try to further this initiative." Borough communications specialist Douglas Shontz said the latex paint used on the crosswalks is not permanent and will likely last for about a month. But, he added, staff are currently looking into making it a permanent installation. Shontz said the goals of the crosswalks are to show State College's commitment to the LGBTQ community and that all are welcome in the community. The borough and UPUA will continue to work together toward a permanent fixture. "UPUA offered to help fund covering the cost of the paint and we’re continuing to work on that with the permanent fixture," Shontz said. "UPUA has been, as always, a great partner in this welcoming initiative just like they were with the 'You Are Welcome Here' banners." The "You Are Welcome Here" banners were unveiled on downtown light posts in the spring to showcase diversity of student residents in State College and highlight Penn State international students. The borough created in 2017 an LGBTQ Advisory Committee as part of efforts established by resolutions to promote equity inclusion and justice. The committee has helped to develop an ordinance banning conversion therapy, which was adopted earlier this year, and plan the installation of gender neutral bathrooms, which have been installed in the Municipal Building, the Pugh Street Parking Garage and at Bellaire Court. In 2011, State College adopted an ordinance prohibiting discrimination in housing, employment or public accommodations based on sexual orientation or gender identity. 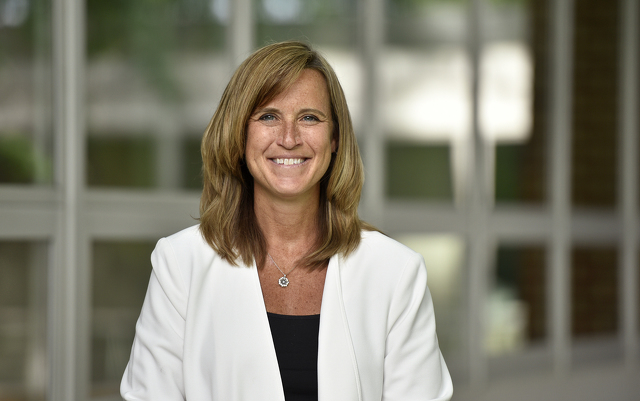 State College Area School Board on Monday approved Danielle Yoder as the new principal for Easterly Parkway Elementary School. Yoder has been principal of Penns Valley Elementary and Intermediate School since 2015 and was previously principal of Centre Hall-Potter Elementary School and Miles Township Elementary School for three years.